I've always have my urban radar tuned to find animated Christmas window displays. Ahh...the nod of a composition elf...the frenetic wave and turn of a Harold Gale Display Company model 606 Santa...these are the things that send my baby-boomer heart aloft in nostalgic yuletide cheer. 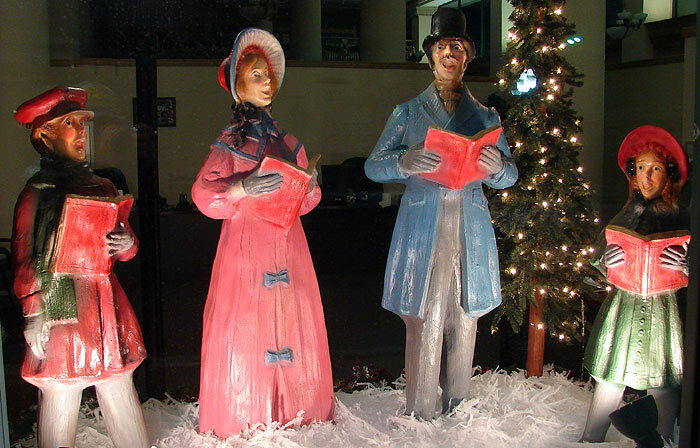 Though I've had no luck with that so far this season, I did run across this static window display of Victorian carolers at the old Newman's Building on Main Street in Joplin, Missouri. The building is in the 600 block of South Main Street, on the seven-block stretch of Main that was (and is) Route 66. The Newman's Building was built in 1910, and housed Newman's Department Store until 1972. 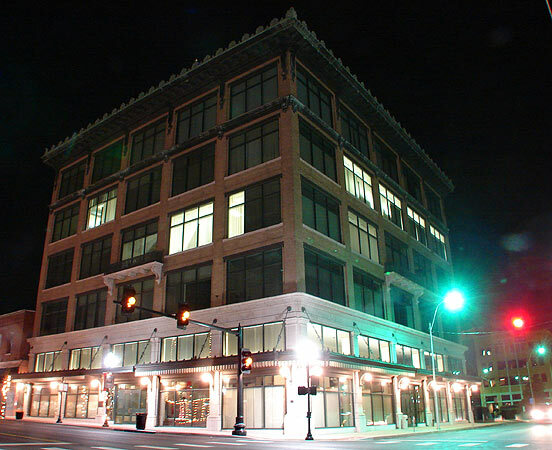 Like many downtown buildings, it had a bit of an uncertain fate in the mall era, but seems to have found a purpose for the moment in housing the Joplin City Hall. You can see a daytime side view of the building in my Flag Day post. 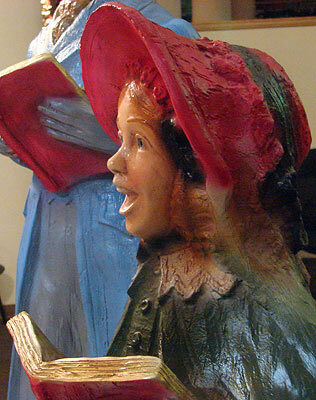 The figures are new, and were manufactured by a company in Louisiana. This lack of vintage status does not bother me. 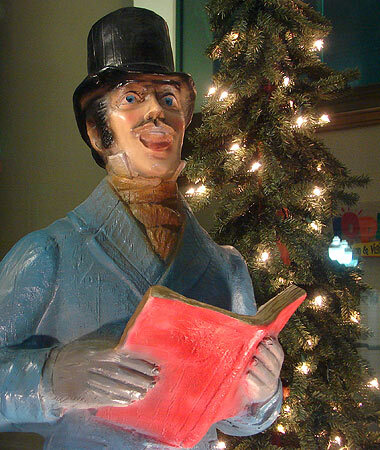 Frankly, it's refreshing to see that any downtown entity decided to put much thought into a holiday display that is more than a stuffed Santa in a window, especially in downtown Joplin, which hasn't been into that sort of thing since its bigger stores went "anchors aweigh" and set sail for Northpark Mall. I remember the intricate animated displays in long-gone stores that thrived in the 1960s Joplin of my youth. I've collected a few from flea markets and such, and seen some colossal displays of surviving pieces, but it's not the same as seeing them in their natural environment. According to a Joplin Globe article, City Clerk Barbara Hogelin says her ultimate goal is to have an animated display in the window. Barbara, you're our kind of people. Hi, I am glad to meet a fellow christmas animation lover. 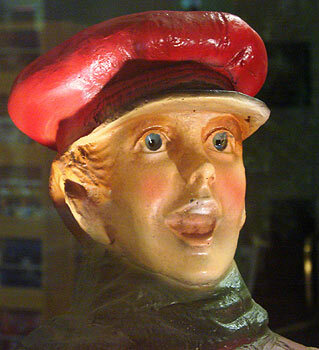 I own a little over 30 display items that were used in large downtown department stores. 2007 marks the first year that some of my own personal collection was used in public and put back in store windows. I live in Richmond Virginia and there are plans to utilize more of my characters and props in multiple spots and share some of the nostalgia that went over so well this year. I would love to talk to you personally to find out more about your collection and I want to thank you so much for the videos you added to the 2006 blog. Ultimately, I would love to go to Kansas and see those items in use. Thank you again and I hope I have a chance to talk to you. I have done quite a bit of research and still have some of the original shipping boxes that the characters were packed in and sent from the factory to the display departments. Hey amonymous, Thanks for the message. Please write meat the email address given in my blogger profile, which can be accessed from the front page of the blog.